David Rodriguez posted a comment on Randall Savage memorial wall. Tobii Guns posted a comment on Randall Savage memorial wall. Michael Keith Taylor posted a comment on Randall Savage memorial wall. Tony Urdiales posted a comment on Randall Savage memorial wall. Mike Williams posted a comment on Randall Savage memorial wall. Jeff Ferguson posted a comment on Randall Savage memorial wall. Raymond Wilk posted a comment on Randall Savage memorial wall. Derrell & Dominique Daughtry uploaded a photo to album Macho Man. James posted a comment on Randall Savage memorial wall. 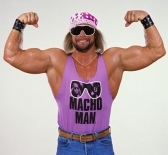 James updated a photo description on album Macho Man.